The following week end had us on the road north once again. This time to visit four who are really near and dear, what's his name and his lovely wife Liz and our two grand children Selena and Zane. It was tough duty but our Marine Corps son, who will retire June 1, 2015 with over 24 years of service and Liz were headed to Atlantic City for his last Marine Corps Ball as an active duty Marine. I can't count how many Balls he has been the MC for but I can assure you he is going to be missed. So Elaine says to our grand daughter Selena, 15..."What are we gonna do with two four year olds?" Of course I'm looking around for the other four year old besides my grandson. Well it shocked me as well! So it's off to the Slot Car track. Here we are...Selena is monitoring our sportsmanship. Yeah right...Zane's screaming "I'm winning Gramps better catch up!" He's still screaming something about "You've been lapped." After awhile we had some others join us on the track. The testosterone was hot and heavy. Then it was off to Build A Bear. Zane decided on Leonardo. Turns out he is a Teenage Mutant Ninja Turtle fan as well as a Marvel Super Hero fan and a Slot Car aficionado. Here were are working on Leonardo's Birth Certificate. I lost count how many Build A Bear characters Selena has...we weren't in the store for five minutes when she's wanting to know if she can have one as well. Of course I put my foot down and said she had to share...it was Zane's turn. That was before we hit Hot Topic. I should have known. I think I was set up. This Birth Certificate thing was quite an ordeal...We had to call in Grammy to get it finished. This was pretty typical...two guys walking the stores looking for the women. "Where do you think they are Gramps?" "Zane if I knew I would most certainly share it with you an Leonardo." But as long as the days were and as far away from home as we were our new travelling accessory was there to comfort and keep us warm and safe as the day came to an end. I slept like a baby. Well I'm only four, remember. 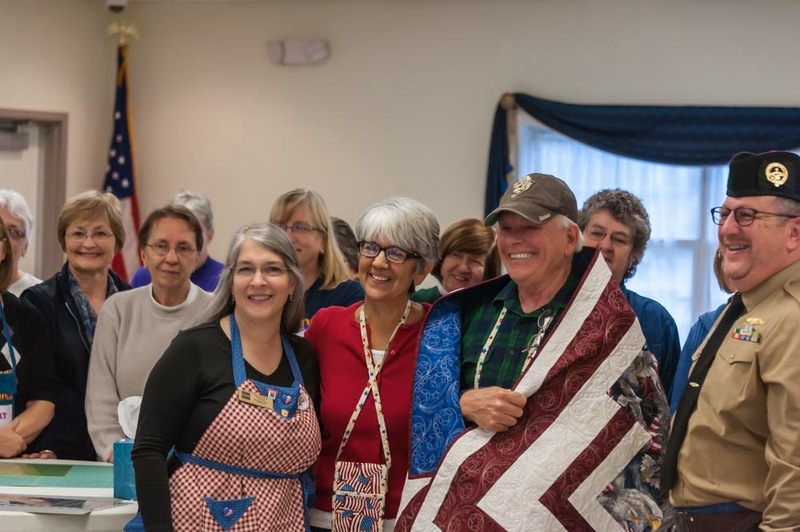 We want to start by saying that as a group of volunteers sewing for Quilts of Valor, being the epitome of unselfishness, kindness, friendship and exemplifying what Quilts of Valor is and has grown into over the last decade because of volunteers like this. 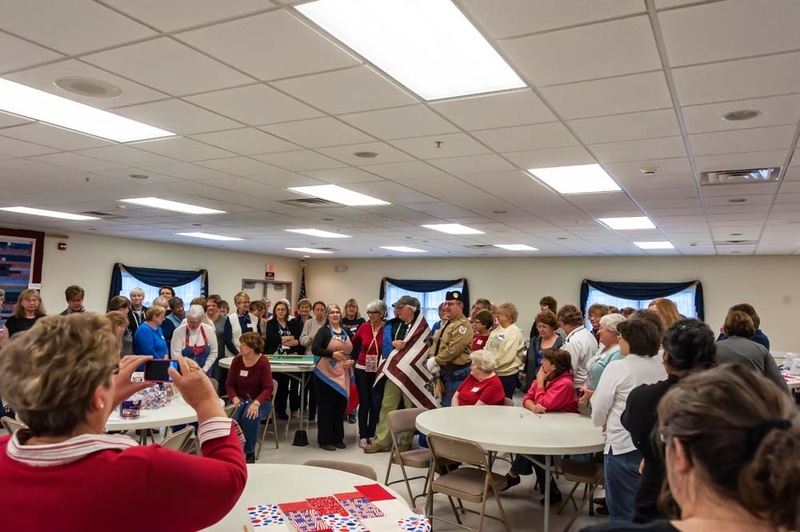 Southern Tier Quilts of Valor exemplifies what it means to Serve Your Nation...Quilt. It is a one day "Marathon" and in that one day the final tally accomplished by the 70 'volunteers' was nothing less than spectacular. Fifty-seven completed tops, put with backs and binding and packaged to be sent to longarmers. Twenty-two tops pieced needing only borders to bring them to acceptable dimensions which will then be packaged with backs and binding and sent to longarmers. One day, twelve hours, 70 people. Supported of course with a little pizza, pasta, a doughnut here, a cookie there, several gallons of coffee and maybe a little chocolate. They say a picture is worth a thousand words...here's a couple of thousand words...or more!!! Snacks...well it's a sew day isn't it. Both lunch and dinner were catered...of course. Not to mention chocolate throughout the day. Backs and bindings ready to be paired up with tops. The piecer could pick the back as soon as the top was done. Elaine even got in on the action. Not to mention going to the Corning Museum. Well I mean really we were in Corning, New York. A special presentation from STQOV to Marriane Elliott for her work with STQOV and the Foundation. It was not a QOV...but be assured it touched her heart. She was awarded her QOV in Tennessee. His Mom (the piecer) and his Grandfather were present. I also had the distinct honor of longarming his quilt. 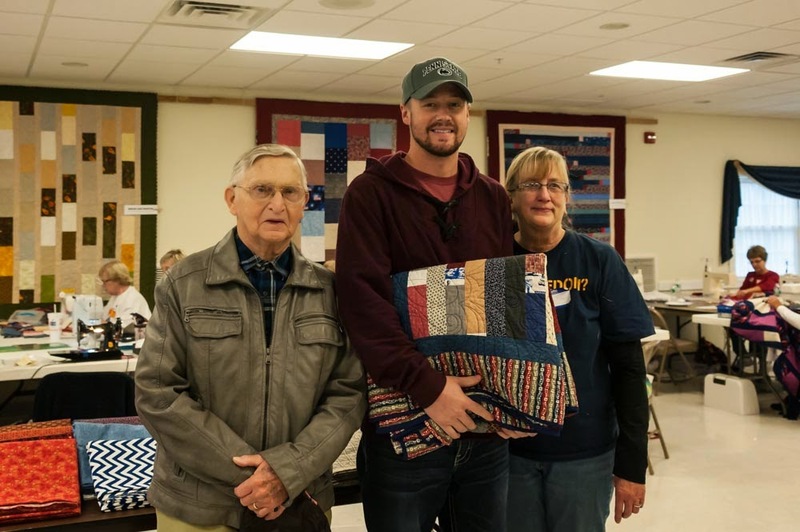 And yes, yours truly was awarded a Quilt of Valor. It was presented by Marianne and Bill Elliott. With all of the volunteers taking a few minutes away from their sewing to share it with me as Elaine stood by my side as she has through it all for the last 47+ years. You couldn't script a better place, with better people, on a better day to be thanked. I'm not unlike any other recipient. 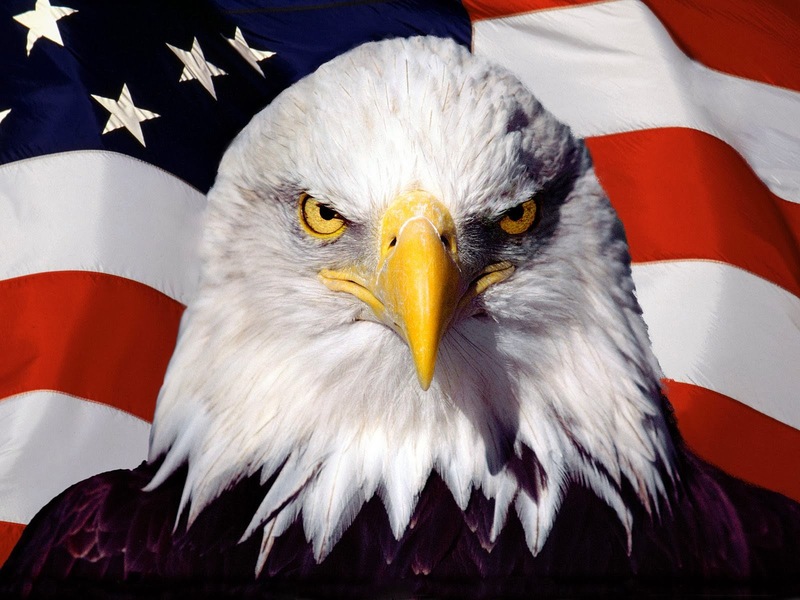 To be thanked in a way that so deeply touches us for doing what we all cherish so much, defending the freedoms of this great Nation. We humbly accept with our deepest of gratitude, gracious for the recognition for what we consider to be our scared duty and just doing our jobs. I wish the piecer, Sharon Ledbetter could have been present...but I'm saving up a big 'quilty hug' to be delivered at a later date. I did mention quilt tops didn't I? What a day...what a group...what a pleasure and honor to be included. STQOV ROCKS!!! And so does Southern Tier Quilts of Valor. To say the last week to ten days is like the tip of the iceberg is like well, the tip of the iceberg. Getting ready for a trip to New York and one to New Jersey, with the holidays rapidly approaching has made for some busy time. Coming off the longarm some Quilts of Valor, a T-Shirt or two and Elaine's raffle quilt for an upcoming QOV Booth at the end of the month has kept us on our toes. I used the Support Ribbon pattern which worked out well. The back was a combination of T's and some fill panels. Next came a colorful quilt that just reeked with talent, color and a whole bunch of seams. Oh did I mention it was Elaine's. A few Quilts of Valor were mixed in and sent out for binding. This one above is the results of handing over a bag full of scrapes and some peculiar shaped blocks to one of the quilters that over the last several years has produced in the neighborhood of 40 quilts for QOV. Her talents can't be described, her dedication is endless. Below was also crafted by a mom, in this case for her son. He is a huge Otter fan, if you couldn't tell. Only had about a zillion little squares. Another T Shirt quilt. The T's reflect a love for the Blues. It was also a 100" wide. I used a musical pattern with a Clef, Bar and Notes...not to mention while under the influence of Johnny Lang and Kenny Wayne Shepard. The last one off the longarm was a raffle quilt Elaine made that we will raffle off at the Christmas Craft Market where space again has been donated by the promoters for a QOVF Booth. This will be our second year with a QOV presence. Elaine has been going for several more years with some of her craft wares with the group Seven Cities Crafter's. Used a heart and swirls pattern to tie the X's and O's all together. The symbolism is in the lone "hug" crossing the hugs and kisses boundaries. The lone X includes the material from the X's and O's. The quilt is named Love Has No Boundaries. We had the privilege of being invited back to the Chesapeake Newcomers Society and presented five to those that were nominated by members of the Society to receive QOV's. This was our second year and more than likely not our last. Left to right: Elaine, SSgt Lucas S., Retired Chief Petty Officer Robert H., yours truly, Retired Lt. Commander Daniel R., Ann H. (the quilter previously mentioned that has been a huge contributor to QOV, our guild and now Not Forgotten QOV), Retired Maj. General Richard S. and Sgt LaQuita R. Combined they represent service from Vietnam, Bosnia, Kuwait, Qatar, Yemen, Pakistan, Somalia, Iraq and Afghanistan. This was Ann's first opportunity to view an awarding of a QOV and her first opportunity to give a "quilty hug." I can assure you it won't be her last and she enjoyed it immensely...all five of them. Yes it was a "tissue alert" for all involved. 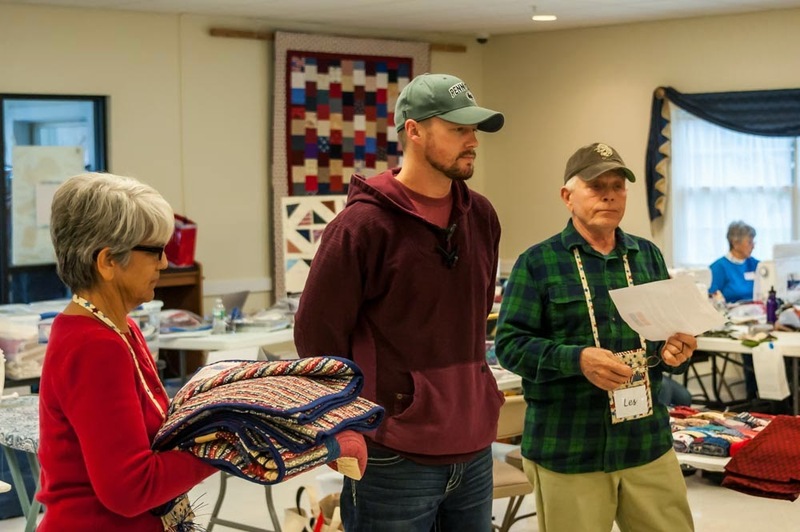 Although we were not in attendance the quilts were from Not Forgotten QOV and shipped to the presenter. He is the Pastor from the recipients church. 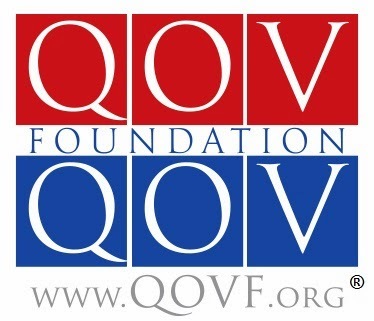 This all started when Wayne H. requested via qovf.org a QOV for himself. During the conversation with Elaine it was learned he had a regular breadfast meeting with five other veterans. Well don't give Elaine an inch...she'll take a mile. The Pastor awarded all six their quilts last week. Wayne has requested to be a presenter for QOV's in his area. We'll most certainly oblige. So we'll be heading to New York for a QOV Marathon...and then a quick return home and then New Jersey bound to see the grand kids. We might even say a howdy to our son. But he knows why we're coming.